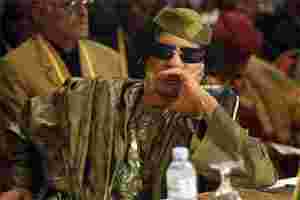 London: Moammar Gadhafi’s apparent death from wounds received during the fall of Sirte means a long and complex trial that could have divided Libya and embarrassed Western governments and oil firms will be avoided. Had he been taken alive, there would have been potentially acrimonious debate over whether he should be tried in Libya or extradited to the International Criminal Court, which issued a warrant for his arrest along with his oldest son and spy chief earlier this year. Any trial might have given the flamboyant, often idiosyncratic Gadhafi a podium from which to harang both Libya’s new rulers and Western powers, as well as potentially try to embarrass them on issues they would rather forget. As Libya was nudged back from international isolation in the last decade, international oil companies signed deals worth billions. But worse still for the transitional government and Nato, analysts say, would have been for Gadhafi to have remained at large, perhaps simply disappearing into the Sahara to form new militias and destabilise Libya and its neighbours. “It is hugely symbolically important," Alan Fraser, Middle East analyst for risk consultancy AKE, said of the killing. “It helps the NTC move on. If Gadhafi has been killed instead of captured, that means they will also avoid a long drawnout trial that could have been very divisive and revealed awkward secrets." Human rights groups had long said it was important for the Libyan leader to be held to account and any local trial would have offered Libya’s new government a chance to showcase its improved accountability. But critics complained many international and locally organised warcrimes trials can sometimes turn into long, drawnout legalistic events or even drift towards becoming show trials. Former leaders such as Saddam Hussein and Slobodan Milosevic often either refused to acknowledge their jurisdiction or use them to berate their new captors. The ousted leader might well have used the opportunity to open old political wounds and inflict as much new political damage as he could. “Colonel Gadhafi’s death is a mixed event for the new Libyan authorities," said Daniel Korski, senior fellow at the European Council on Foreign Relations and a long-term supporter of Nato intervention. “They avoid a drawn-out judicial drama a la Slobodan Milosevic, which could have rallied people in the ex-dictator’s support, but his death also robs the new Libyan government of the opportunity of showing themselves better than he was.... His death, in such violent circumstances, also risks creating a martyr figure out of a man whose deeds in life would never have merited such acclaim." International media would have jumped on any juicy details on how Western states wooed Gadhafi, helped bank his billions and rebuild his oil industry. Many large firms struck deals with Tripoli including Italy’s ENI, France’s Total, Britain’s BP and others. That risk has not entirely gone away. Some of Gadhafi’s sons may still be at large and could potentially stand trial themselves. If Libya’s NTC had wanted to try Gadhafi locally, they would have had to swiftly build an entire legal system within which to do so. Gadhafi’s Libya had little in the way of credible legal infrastructure and there might have been serious questions over the legitimacy of any process. With Osama bin Laden killed in a US special forces raid earlier this year and al Qaeda and Taliban leaders also increasingly targeted through drone strikes, some worry assassination or “accidental" killing of foes -- rather than messy trials or imprisonment in places like Guantanemo Bay -- has become an all too attractive option. “To say that it is better for everyone that he be killed rather than captured is to say that the legal approach has disadvantages, and that is to surrender to cynicism," said Rosemary Hollis, head of the Middle East studies program at London’s City University. “It’s hard to see that as a good thing. In Gadhafi’s case, on previous form had he been put on trial he would simply have rambled endlessly and would have ended up undermining his own credibility." With his death, she said, there was a risk the death might further incense some of his more diehard supporters and other radicals, particularly if it emerged he was killed by the Nato strike or executed after capture. Other analysts warn Gadhafi’s death may be far from the end of Libya’s troubles. “If you look at Iraq, Saddam Hussein’s capture did not stop the insurgency," says Anthony Skinner, Middle East director of risk consultancy Maplecroft. “They are both very different countries, but Libya also has ethnic divisions and whatever happens there are a lot of issues to solve."